Things have been a bit stormy around here, not just the weather but my life, I have had to reassess many things, and I feel that now I am starting to see sunshine and with that, lots of colour. Colour is what got me through; it makes my heart sing with joy. I haven’t done much art or bloggeds over the last month or so or maybe even longer, events and personal health conspired against me. However, I have managed to do creative things. I have a new obsession - crochet! When I was in hospital last September one of the nurses took pity on my frustration at not being able to do any art (they had put the drippy thingy in my right hand and it was awkward to draw with). 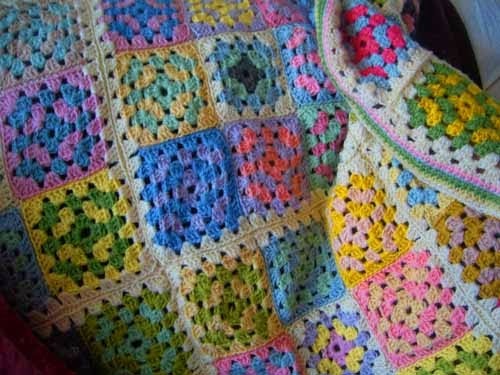 She came in with a basket of bright wool and crochet hooks and said would I do grannie squares for the children’s ward. She put some foamy tubing on the needle so I could hold the hook without any problems, Yay! So for that week I crocheted away using the brightest colours ever! Of course when I got home, I had to dig out my old tapestry wools (I had a tapestry kit making business in a past life) and voila last week I finish my first blanket. It is more of a throw really. I ran out of wool. So pleased with that I sneaked into the local wool shop and have started to collect the different colours of my boudoir. 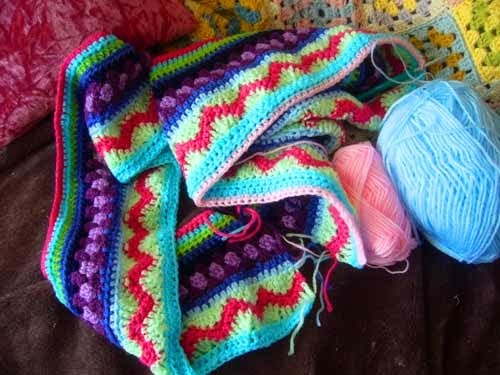 Thus I have now started on a new project – a large blanket but a stripy one with all sorts of crochet stitches. Back to art, I have been looking at work I did earlier in the year and the ones that made me feel good were the colourful ones I did in July and August such as Tweety Bird below. My heart sang, so colour here I come! At long last my head is buzzing with joy! 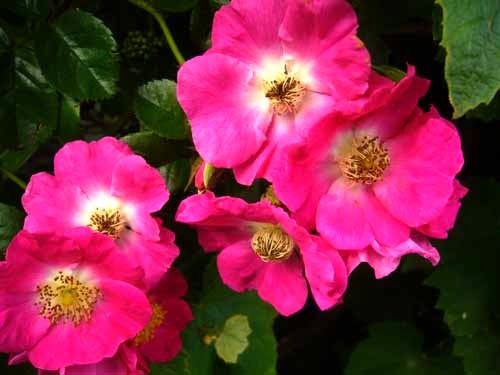 Here is a photo of a climbing rose that I have along the drive way, it also makes my heart sing. Today I am linking up with Eva and Kristin at Paint PartyFriday, thanks for visiting and have a blessed week. fab all this art and crocheting Sharon! Wonderful to read you! I hope your '"storm" recedes, and all is well, Sharon! I took out my knitting needles this week, my winter sport! You accomplished some very pretty first endeavors! Crochet is fun and faster than knitting! Enjoy! Fun art too! HPPF! Oh my goodness these are gorgeous.. I was a huge crocheter back in the day. A few years ago I did some fun scarves of mixed colors... But I love your blankets...especially the new one that reminds me of your art in all the different stitches and colors!! 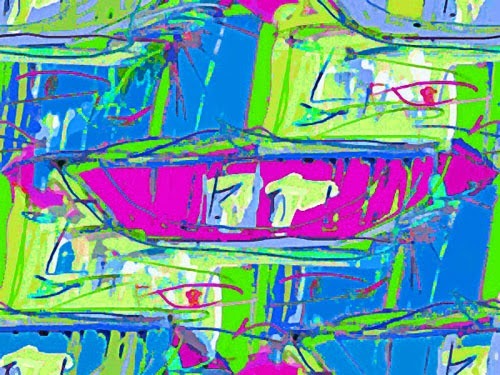 I wrote about color last week..and feel verbatim the same way you do!! Color on girlfriend!!! I LOVE IT when you do!! So wonderful and colourful! This is a great post to look at. I love color too. That stripey blanket is soooo wonderful! Your blanket is gorgeous and I love your colourful art. Glad you are feeling better. I'm so glad you're feeling better. I love your crocheting. Isn't it great you learned a fun new way to create during a hard time? I love color too! It makes me happy even when I'm blue. So glad to see your beautiful crochet project (that nurse was an angel in disguise). Loving the happy stripe blanket you are making now. The colors sing and each time you look at it, it will make your heart sing too! Love the colorful paintings! Welcome back! 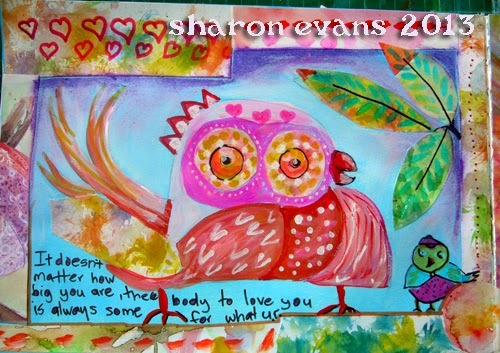 what happy colorful projects Sharon! So glad to know you're feeling better and arting , and crocheting such lovely throws. Happy PPF! 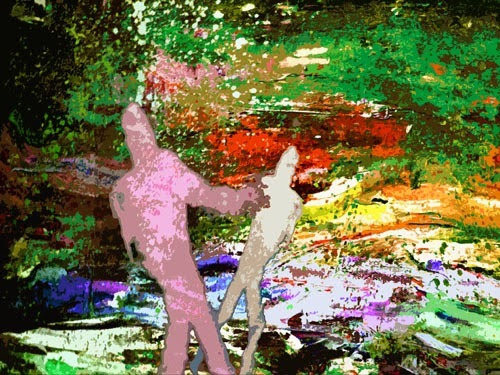 Beautiful colours and beautiful creations and thoughts. Thank you for sharing! I'm sorry to hear things have been stormy for you.i hope its all behind you know and you've got your art mojo back again. I love that crocheted blanket. I would love to be able to make things like that. Is it difficult to do? What a great idea the nurse had to get you to crochet and how wonderful that you've discovereda love (& a talent) for it. Love the crocheted blanket with its warm colors. Well done on all despite unwanted events happening. I hope you are doing better and that life brightens up for you now. You are right about bright colors as they make me very happy also. Take care, great work. Glad you're back again! Hope from now on the storms are over! I love your crocheted blanket, and the new one you just started looks very promising. Colours make me happy too. You're right to surround yourself with it! Sharon what a burst of color here, keep bright, happy and have a colorful week-end! Your love of life and care for others is coming through in living colors. I love your crochet work, especially that colorful band with all the cool patterns. Blessings, my friend! Beautiful, joyful colors and wonderful crocheting! Looks so sweet and cozy! What is the Key to Your Heart?